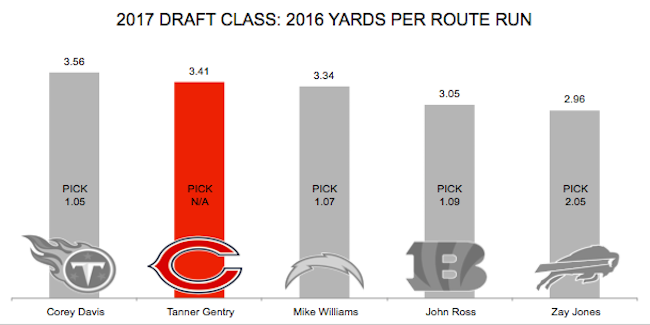 Following the draft, the Bears signed former Wyoming WR Tanner Gentry as an undrafted free agent. In 2016, he graded as the 13th-best WR in the class (minimum 600 snaps). Gentry was the most active deep threat in college football last year. He had 49 deep passing targets (3.5 targets per game) and caught 22 of them, both tops in the FBS in 2016. Compared to the rest of the NFC North, the Bears threw the most catchable deep balls (33) and had the highest proportion of deep-ball targets (20.2 percent) last season. Josh Allen, Gentry’s quarterback in 2016, had a 91.6 NFL QB rating overall. When targeting Gentry, his rating was 124.6.